What Jobs Can You Expect with an Environmental Science Degree? With another brutal winter just around the corner, perhaps there is no better time to consider the history of climate change. While it is evident that humans have had an impact on the environment, the climate has changed naturally without our help for hundreds of thousands of years. As far as we know, it has always gone through cycles, which makes studying the environment both trickier and more important at the same time. According to NASA, there have been seven glacial cycles within the past 650,000 years, the most recent being 7,000 years ago, marking the beginning of the modern climate era and human civilization as we know it. While there are no documented sources of weather patterns or history before the Industrial Revolution, scientists have been able to analyze indirect measures of climate such as ice cores, tree rings, glacier lengths, pollen remains, and ocean sediments in order to gain an understanding of weather patterns in previous epochs. The National Climatic Data Center has an impressive timeline of human progress and its affect on the climate. Below are listed a few of the more notable changes and weather disasters. Notice the diversity of catastrophes and climates these horrendous events have taken place. Consider also the exponential growth of human population, despite nature doing everything in its power to stop us. ~34 – 20 million years ago – Antarctic ice sheet began to form, major mountain ranges were formed, and mammals became dominant. ~15,000 years ago – Abrupt cooling followed by abrupt warming sparks a climatic ripple effect impacting habitats around the world. 10,000 years ago – An estimated 5 million people inhabit the entire planet. 8,200 years ago – Widespread and abrupt climate change. 1100 AD – Elaborate building efforts that cleared woods and forests for agriculture in Europe and elsewhere resulted in changes in land cover, contributing to changes in regional climate. 1849 – Prolonged drought in Arizona lasts until 1905. 1930s – Dust Bowl drought impacts 100 million acres of Great Plains. 1931 – Flooding along Yangtze River, impacting millions of Chinese. 1940s – Global cooling occurs between mid-1940s and early 1970s. 1958 – Typhoon Vera hits Japan, killing nearly 5,000, leaving 1.5 million homeless. 1971 – Flooding in Vietnam kills 100,000. 1972 – Blizzard in Iran leaves 4,000 dead. 1982 – El Niño severely impacts fishing industry in Ecuador and Peru, disrupting weather throughout the Pacific Basin. 1992 – Hurricane Andrew hits Florida, killing 54, costing $25 billion. 1995 – Heat wave hits central US, causing 830 deaths, 525 of them in Chicago. 1998 – Hurricane Mitch devastates Central America, killing estimated 11,000. 2000 – Wildfires in the Western US burn over 6 million acres and cost over $1 billion to fight. 2008 – Half a century after beginning observations at Mauna Loa, the Keeling project shows that CO2 concentrations have risen from 315 parts per million (ppm) in 1958 to 380ppm in 2008. 2011 – Human population reaches 7 billion. In 1000 AD, the population was ~254 Million. 2012 – Arctic sea ice reaches a minimum extent of 3.41 million sq km (1.32 million sq mi), a record for the lowest summer cover since satellite measurements began in 1979. Some of the natural forces that can alter the climate include variations in the sun’s energy, changes in the reflectivity of the Earth’s atmosphere and surface, volcanic eruptions,and greenhouse gases. 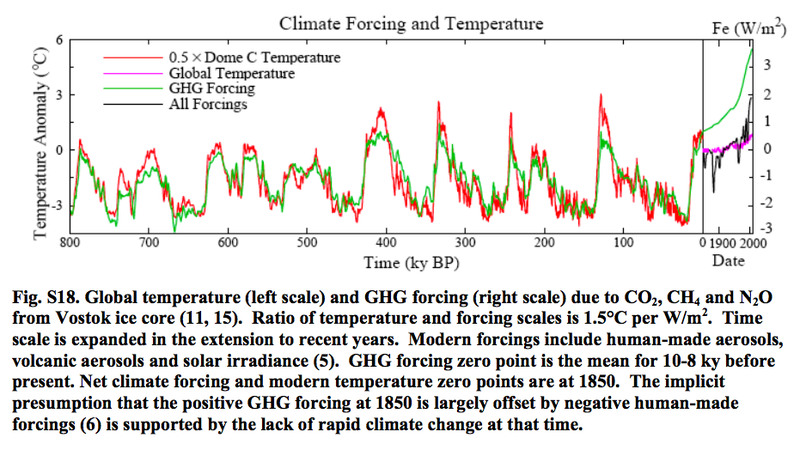 These factors were responsible for changes in climate before the Industrial Revolution. However, since the late 1700s, humans can take most of the credit for affecting the climate. For instance, according to NASA, solar energy cannot be responsible for making the planet warmer. Studies have show that there is actually an observed cooling in the upper atmosphere, while the warming is observed on the Earth’s surface and in the lower atmosphere. This can be explained by the Greenhouse Effect. The EPA has come up with the best analogy to describe how greenhouse gases work: “Greenhouse gases act like a blanket around Earth, trapping energy in the atmosphere and causing it to warm.” Possibly the earliest reference to the “greenhouse effect” was written by Joseph Fourier, a French physicist, in 1824. He wrote: “The temperature [of the Earth] can be augmented by the interposition of the atmosphere, because heat in the state of light finds less resistance in penetrating the air, than in re-passing into the air when converted into non-luminous heat.” While carbon dioxide (CO2) is a natural part of this process, the massive emissions of CO2 released by humans is what’s made the current level in the atmosphere higher than it has been in at least 800,000 years. Finally, we must talk about the Milankovich Cycles. This 100,000 year cycle is what people commonly refer to when talking about the natural cycle of climate. They are caused by the Earth’s orbit around the sun, the tilt of the Earth on its axis, and the wobble of its axis. However, evidence suggests that we have escaped this natural cycle, due to the increased CO2 levels in the atmosphere. While some are still talking about global warming vs. climate change, or when the next “polar vortex” is going to hit, others are taking great leaps forward in the hopes of stopping or slowing this drastic climate change. No matter your personal beliefs, remember to consider all sides of the issue, particularly in the objective field of science. It is important to understand the history of natural climate change so as to know when irregularities appear. Keep this in mind when you are looking for degree programs related to environmental science. Those that do not remember history are doomed to repeat it. But if we don’t act soon, future generations won’t even have any chance at all. This entry was posted in Climate Change, Environmental Science and tagged climate change, Environmental Science, EPA, global warming, greenhouse warming, history, NASA. Bookmark the permalink.